This Simple Quick Italian Tomato Sauce has saved me more than once when the clock turned to five (or six) and I needed something on the table in a jiff that I knew everyone would want to eat! I first saw this, I think, ono America’s Test Kitchen and was intrigued. And thanks to those geniuses, I can make an Italian Tomato sauce in under 20 minutes from a few herbs and a can of tomatoes. Best of all, Simple Quick Italian Tomato Sauce is much better than anything you can buy in a jar – and tastes so much fresher. No matter how bare the cupboard or the fridge (especially before shopping day) we always have a few boxes of pasta around and cans of tomatoes. There’s generally at least an onion or two rolling around, and I usually have fresh herbs in the garden or in a pot. If I don’t, I can use dried herbs or whip up some of my Homemade Italian Seasoning Blend. In about 20 minutes, about the same time it takes to bring a pot of water to a boil and cook the pasta, I can throw together a great tomato sauce! 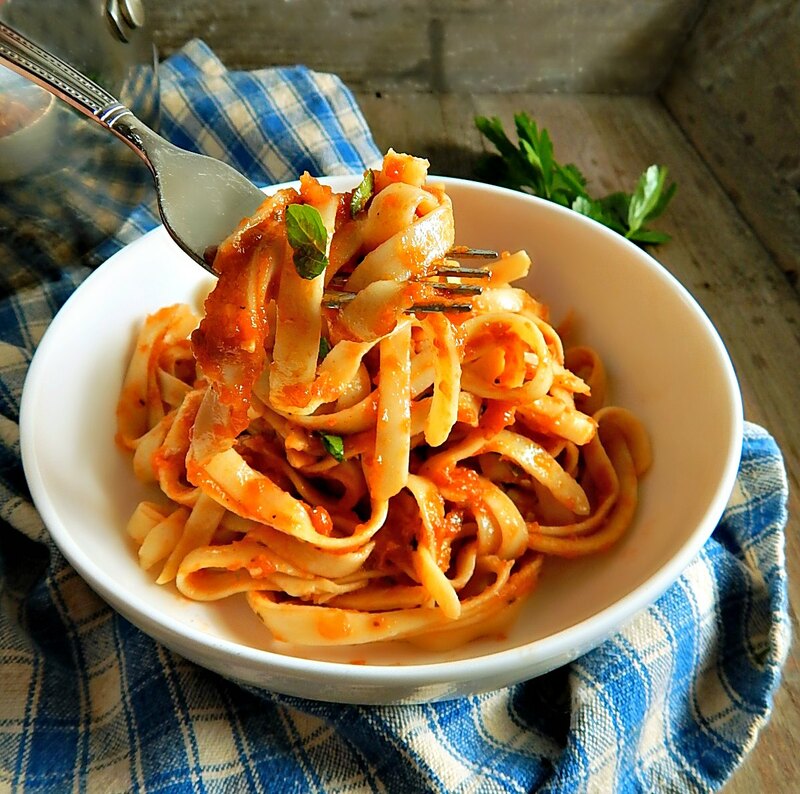 This Simple Quick Italian Tomato Sauce is vegetarian but you can do the same thing with it that I used to do with a jarred pasta sauce when I was serving anyone that expected a beefy Italian Spaghetti sauce. Just brown up some ground beef, drain and add in the sauce to simmer and reduce. Of course, you’re not limited to using a tomato sauce like this over pasta – Try it over sauteed peppers and onions, with or without sausage, drizzle over Italian style meatloaf or stuffed vegetables. I often cook it just a bit longer to thicken it up more when I’m planning on using this for pizza sauce. Simple Quick Italian Tomato Sauce makes about the same amount as a jarred pasta sauce, so substitute it at your will. There’s not much to know about making this super quick, super easy sauce. The onions, grated, cook down easily and the sauce still manages to have a great flavor in no time at all. I suggest using a large, wide pot so the reduction happens quickly and use a pot with high enough sides to avoid spattering. I often double this sauce to have extra on hand. It freezes very well. This is one of those pasta sauces that really lends itself well to adding the well-drained pasta right to the pot then serving. If I don’t do that and happen to have a little leftover I love to make Spaghetti Pie. Just layer about two cups of leftover spaghetti, mixed with two eggs and a 1/4 to 1/2 cup Parmesan cheese. Add a layer of Ricotta, Cottage Cheese or Bechemal, then top with the leftover sauce. Mozzarella goes on top as much or as little as you’d like. There’s another Cook’s Illustrated/America’s Test Kitchen Pasta sauce on my site that I just love, too, a Quick Marinara. It’s similar but has its own spin.n Or maybe you’d like to take a peek at some of my other favorite Pasta Meals on my site. Spaghetti Pie, always a great leftover option. The pricing of making your own opposed to buying in jar is dependent upon a number of factors – full price to full price for this homemade Simple Quick Italian Tomato Sauce compared to a jar makes the homemade pretty cost-effective. Sales prices make things unpredictable. Add in a coupon or two and all bets are off. I don’t use coupons as much now that my store doesn’t double any longer, but I do watch the sale prices closely for tomatoes and stock up at a low. I habitually buy the larger cans of whole tomatoes and just break them down in the blender when I want tomato sauce. If I only need a small can of tomatoes, I just divide the larger can in two (they large cans are about 29 ounces) and add the extra to a Ziploc and freeze. I try to do this right away so I’m not tempted to shove the can of tomatoes in the fridge. That never bodes well! By the time I think about them again, usually, they’re too old to use and that can is starting to corrode, and that’s a waste. I mentioned I grow herbs. It makes such a big difference in my recipes and even more, it makes me feel better about the recipes I’m cooking. Special, maybe? I bring them inside when fall hits and try to keep them alive through the winter, then replant them in the spring. There’s not much of a risk in growing your own. Even if you kill your herbs off, the cost of a plant is usually a fraction of a tiny packet at the store. If you kill it, just dry it and put it in a jar. Heat oil in medium saucepan. Add onion, oregano, and ½ teaspoon salt; cook, stirring occasionally until liquid has evaporated and onion is golden brown, about 5 minutes. Add garlic and cook until fragrant, about 30 seconds. Stir in tomatoes and sugar; increase heat to high and bring to simmer. Lower heat to medium-low and simmer until thickened slightly, about 15 – 20 minutes. Off heat, stir in basil and additional oil; season with salt and pepper. Serve. Grating the onion makes the recipe go really fast and reduces the need to simmer longer and mellow out the flavor. If you don’t have fresh herbs, use a quarter of the amount of dried herbs or substitute about a teaspoon of Italian Seasoning. Add dried herbs in at the beginning of the cooking process. This entry was posted in Click here for Bargain Meals, Click here for Fabulous Food Posts and tagged canned tomatoes, Cook's Illustrated, Freezes Well, Italian, Marina, Pasta, Tomato sauce, Tomatoes, Vegetarian Meal. Bookmark the permalink.